We often find lunch is the hardest meal of the day, you can end up eating the same thing each day and if you want to have to take time out of the day to make it. If like us you were lacking inspiration for your midday meals, take a look at some great places you might not know about. Ideal for a long lunch or to grab a quick bite. Tucked away at the bottom of the high street this is a new discovery to us and it’s one that shouldn't be missed. You can chose from a range of cooked foods like pastas and beef stew as well as a selection of sandwiches. They also sell wines, coffee and tea in the back of the cafe, and their cabinets are full of interesting deli meats and cheeses and olives. Save room for dessert as there's usually a cake or pastries on offer from the counter too. We went for the ultimate cheese toastie and a reuben. Cheese toastie was three slices of bread glued together with a few different cheeses and a seasoning of paprika. You also get a little dish of warm tomato soup to dip the toasty in, this little touch is what makes it the ultimate toastie. The reuben was also delicious if a bit less indulgent and more traditional. 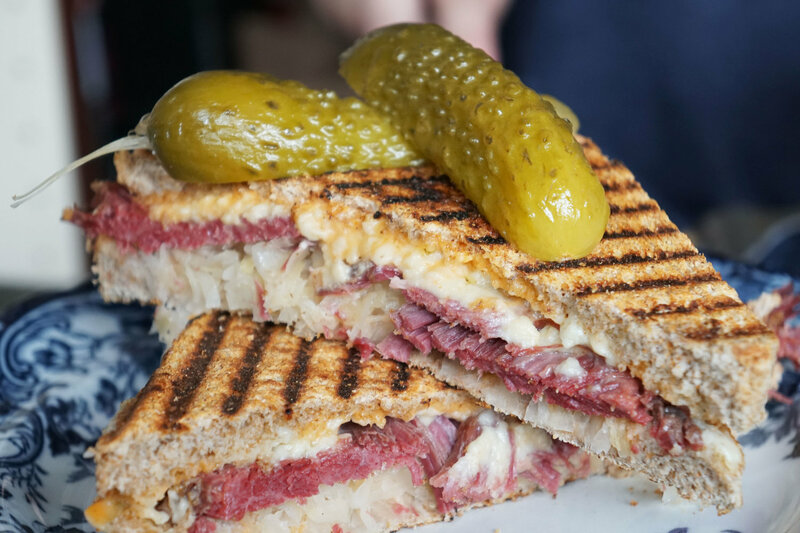 It's a salt beef and sauerkraut toasted sandwich with a pickle on the side. A classic sandwich, that's simple salty and satisfying. The sandwiches are available to take away, a great tip if you want to grab a delicious lunch on the go. We placed an order through The Town Kitchen's Facebook page. It was halloween when we ordered lunch from The Town Kitchen. They offer free delivery or you can collect from their home in Deal, we decided to pick up. When I arrived the house was decorated and Jill answered the door in a witches hat. Jill cooks the food at her home kitchen and posts pictures of it on facebook, where you can put in your lunch orders for the week. You can also find Jill at Deal Town Hall market on Fridays. 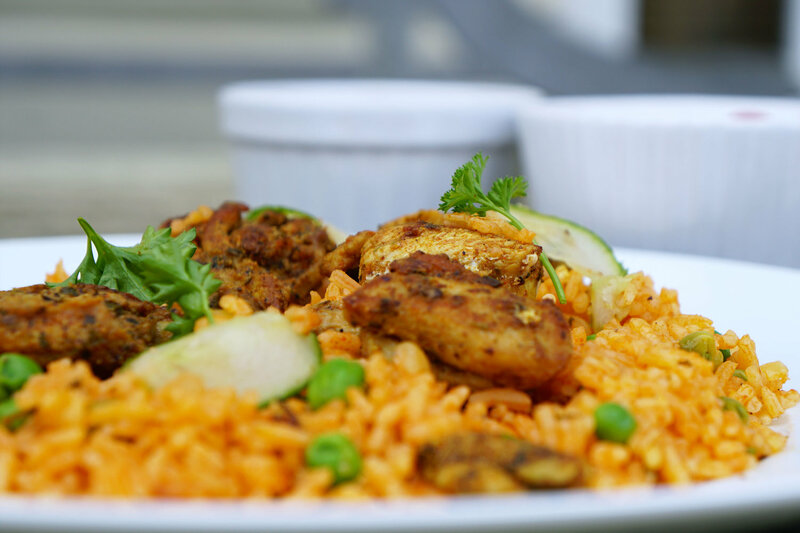 On the menu for lunch that week was pinchos morunos - a type of marinated chicken kebab with fresh Tomato Salsa and Spanish Rice all coming to just £3.50 per person. Jill even wrote my name on a bay leaf attached to the bag which was a nice touch. We heated the food up in the microwave and plated up when we got home. Everything was beautifully cooked and full of fragrant flavour. The spicy sauce that we put over the rice was tangy and gave a little heat but not too much. 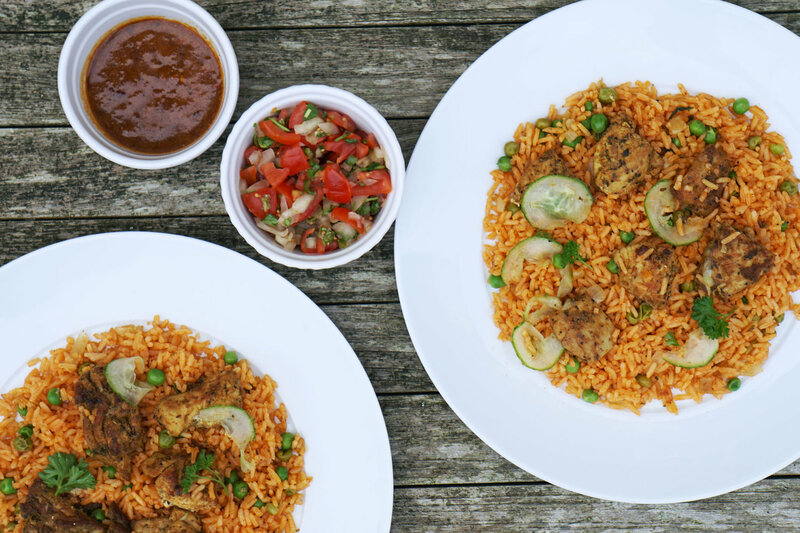 The chicken was succulent and the salsa on the side was a nice hit of fresh tomato onion and coriander. A delicious meal, and something a little different to what you usually find on a lunch menu. We’ll definitely be ordering from Jill again, the price was also really reasonable for the amount of food we got. We often pop into The Hope and Lane for their flavoured iced teas or to grab a drink on the go. 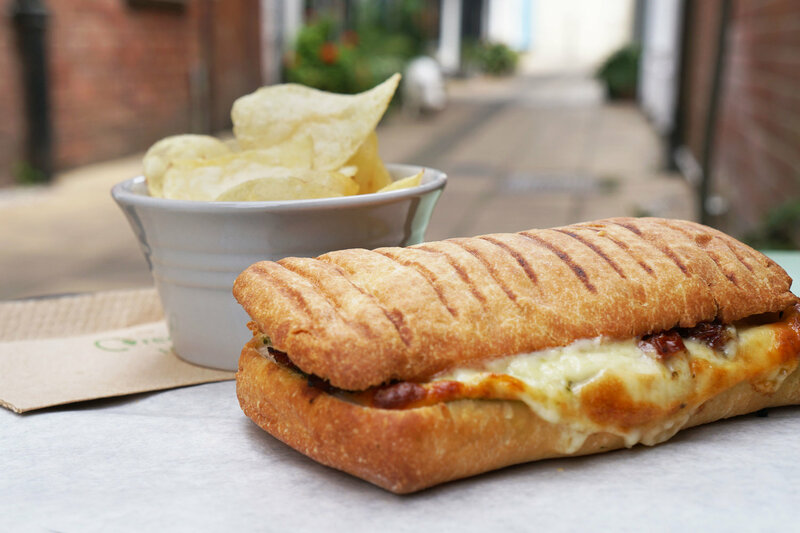 Lunch is a great option too as you can sit in a window seat and watch the world go by. In the summer or a fine day it’s nice to sit outside too. For lunch we chose a ham and cheese Stromboli and a tomato and mozzarella panini. Both came heated up and the panini with a little pot of crisps on the side. A satisfying lunch, not too heavy but it saw us through the rest of the day until dinner. Nothing mind blowing but a good dependable toasted panini. The Stromboli- an Italian American invention, consisting of a bread outside filled with meats and cheese was also good, decent flavours. 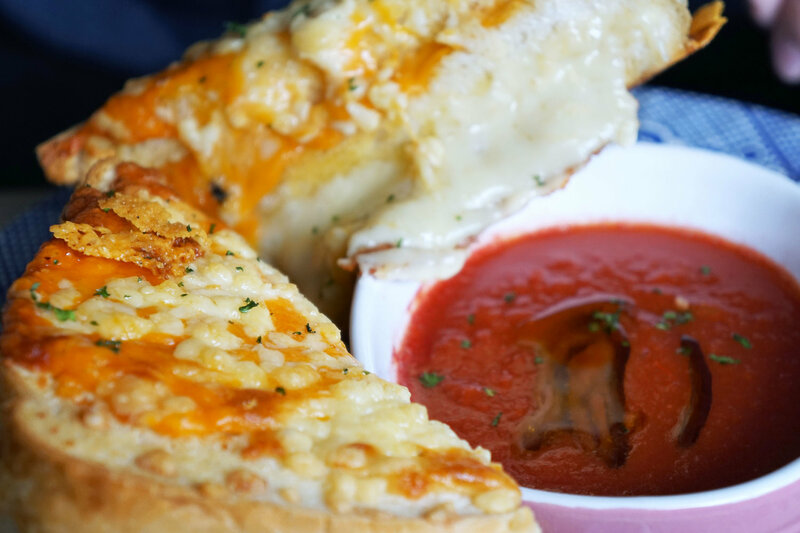 You can't really go wrong with melted cheese. 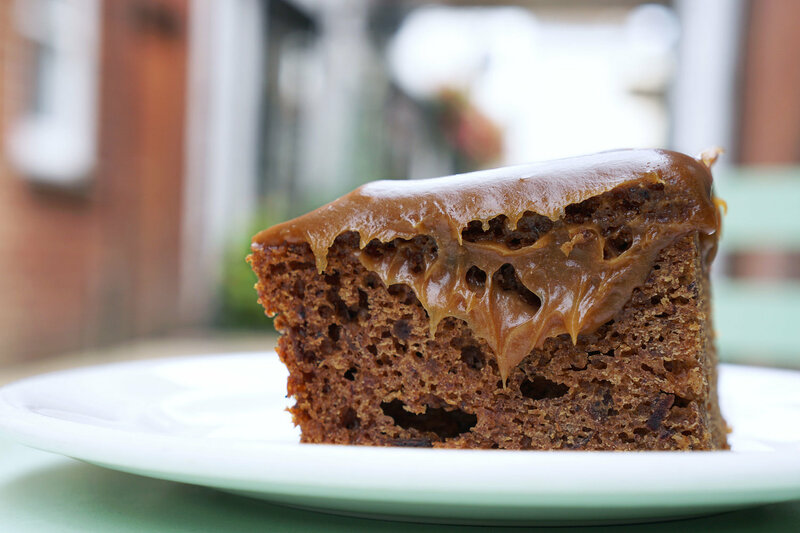 The Hope and Lane also have a nice selection of pastries and cakes, we chose a sticky toffee tray bake. It was pretty big so we cut it in half to share. Good enough to satisfy any sweet craving and a good ending to a nice lunch out in town. 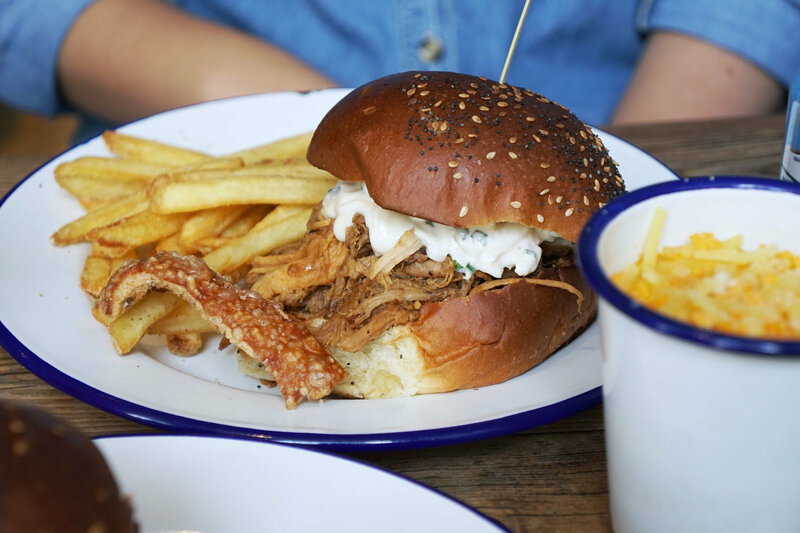 Pork and Co is one of our favourite spots in Canterbury for lunch, you can get food to take away from their downstairs counter or get a table to eat in upstairs. 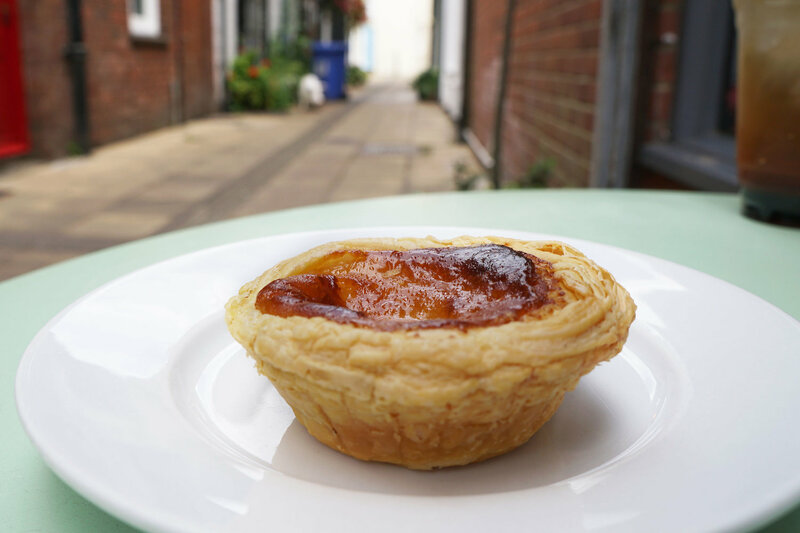 Although not technically in Deal, it is well worth checking out when your in Canterbury and with Christmas shopping coming up we couldn't leave this off the list. We usually eat in then pick up some treats to take home on the way out, we love a good pork crackling and there's is hard to top. We went for a pulled pork roll and buttermilk fried chicken roll which both come with a choice of slaw and sauce and a side of fries. You also get a few pieces of pork crackling with the pork dish, so good we bought a bag of them on our way out. The mac n cheese is a must here, so we ordered a small portion to share. All in all a giant lunch, but the food is too good to miss out on. We like that you can pick the sauces and slaws as they have so much choice, like garlic mayo, apple butter, chilli and herb. Although the pork is great as you’d expect from somewhere that has pork in its name, the other food on the menu lives up to it too. The fried chicken is a particular favorite, you always get a big piece of breast meat and it’s seasoned to perfection. Great texture, not too greasy either. Make sure to look out for them next time you’re in Canterbury.